The Estacada area will get spooky in the next few weeks. There are a variety of events planned in which attendees can interact with ghosts, hear scary stories and walk through haunted farms and barns. Here's a look at some of the activities that will connect you with the things that go bump in the night. Wenzel Farm Fantasy Trail: 7-10 p.m. daily and noon to 5 p.m. Friday, Saturday and Sunday through Oct. 30. This 1,000 wooded trail at 19754 South Ridge Road features a variety of spooky sights and sounds, a castle, a maze, a suspension bridge and more. Pumpkins and refreshments are available for purchase. Cash only admission is $7 for adults and $6 for children younger than 12. The Tell-Tale Heart and Other Chillers: 7-8 p.m. Friday, Oct. 19. Professional storyteller Christopher Leebrick will perform "The Tell-Tale Heart" and several other pieces by Edgar Allan Poe, along with additional spooky pieces, at the Estacada Public Library, 825 N.W. Wade St. The evening will also feature a discussion of Poe. Though the program was designed for adults, teens 14 and older may attend with a guardian. Trick or Treat for the Animals: 1-4 p.m. Saturday, Oct. 27. At Out to Pasture Animal Sanctuary, 33190 S.E. Regan Hill Road, attendees can spend time with goats, pigs and other creatures while enjoying a bake sale, raffle, party games, pumpkin painting, a haunted barn and more. Suggested donation is $5. Springwater Grange Halloween Party: 4-7 p.m. Saturday, Oct. 27. This gathering at the grange at 24591 S. Springwater Road features a potluck at 4 p.m. and games from 5-7 p.m. There will also be a costume contest. All ages are welcome. Haunted Farm: 6-8 p.m. Saturday, Oct. 27. Meet some of the ghosts of Eagle Creek's past during this family friendly event at Philip Foster Farm, 22725 S.E. Eagle Creek Road. Admission is $5 per person or $20 per family. Ultimate Halloween Party: 7-11 p.m. Saturday, Oct. 27. This party at The Cazadero, 352 S.E. Highway 211, encourages attendees to wear costumes and participate in a variety of games. Creepy Crawl: 4-6 p.m. Wednesday, Oct. 31. 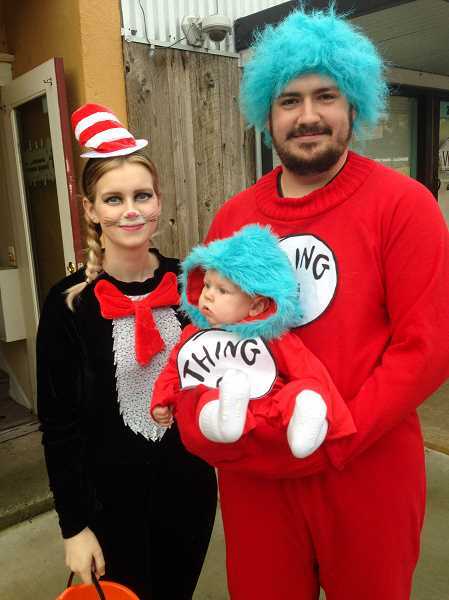 During the event hosted by the Estacada Chamber of Commerce, children can trick or treat at participating downtown businesses. Trick or Treating at Whispering Pines: 4-6 p.m. Wednesday, Oct. 31. Whispering Pines Senior Village, 525 N.W. Sixth Avenue, will welcome trick or treaters on Halloween. Trunk or Treat: 6:30-7:30 p.m. Wednesday, Oct. 31. The theme Estacada Assembly of God Church's trunk or treat is candy land. The event at at 478 N.W. Wade St. will connect children with candy from participating cars.